It all began in Berlin. SSWC 2004, the bus to the race site. A double-decker with seats along the windows, in the rear. I talked to Rudy for a while. I don't remember what we talked about, but it wasn't fixed gears. Then I saw him riding, during the race. I don't know why, but something in my head completely switched over that day. As soon as I got home, I built my first fixed wheel. I used a Promax disc front hub respaced to 135mm with a DX sprocket drilled out to fit on the disc adapter. Right from the start I knew that this it. Biking would never be the same again! Being attached to my bike that way, surfing my trails in this indescribable unity of man and material just blew my brain. Then: a crack in the right chain stay. I accidentally found a perfect setup for Sissy by mounting an old Tange Struts fork. Lilli's geometry is even better. I don't often use a rear brake, but the cable housing in the top tube is perfect for the cable between the battery and the lamp. I've covered the upper surface of the top tube with motorcycle tank foil, because I love putting my feet up on long descents. Recently I mounted a 750 grams Soma 456 steel track bar, with a white powdered Shogun stem and Brooks leather bar tape. It's great to rock my not-so-heavy trails lying on the bike, hands on the lower ends of the bar. I live in a flat region, so I don't get many chances to ride the trickier and steeper stuff, so I decided to give up on the multiple positions of the track bar and switch to H-bar setup. 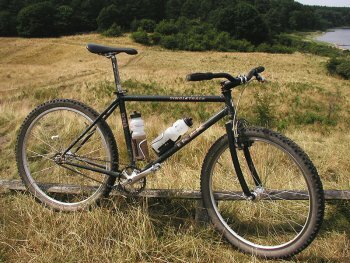 H-bars are expensive, but there's always someone who can help on our singlespeed forum! Lilli has just been given a 'beheaded' A-bar, welded from 2mm thick STS steel and weighing almost exactly one kilo. It's slightly narrower than the original H-Bar and powdercoated in black. Meik Weissert rides mostly fixed. 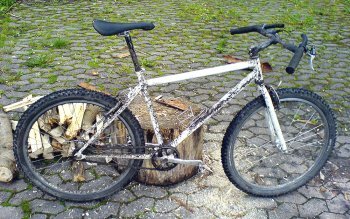 Meik's thread is still in place on the German single speed forum. 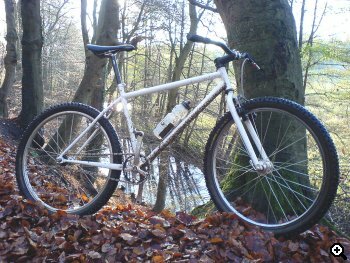 Germans Cycles have their own site here.